The Witch Doctor, abbreviated WD, is a pure spellcaster, dealing with elemental magic, nature magic, necromancy and alchemy. 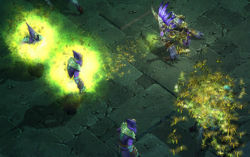 The class has taken some inspiration from the Necromancer of Diablo II, in its ability to summon pets of various types, as well as cast some mind control spells. The Witch Doctor is a much more active, spell-attacking class than the Necromancer was, though. A Witch Doctor can not succeed just summoning pets and sitting back; he must venture in much closer to the fray, constantly using attack spells to supplement the damage dealt by various short-lived pets. 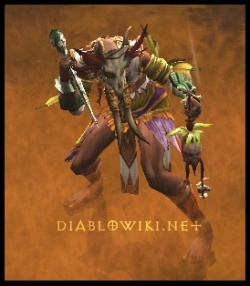 The Witch Doctor looks a bit like the top half of one of Diablo II's Flayer Shaman, especially when outfitted in one of his oversized, colourful tribal masks. There is even a Flayer Shaman called Witch Doctor Endugu. Judging by the skills thus far demonstrated, the WD fights a lot like a Necromancer, using cunning and guile, rather than direct physical attacks. Witch Doctors possess a number of mind control spells, the ability to summon and control undead servants, and a variety of direct damage elemental attacks. The D3 Team has described the Witch Doctor as old, grizzled and fanatical. His magic is not clean and easy, like the fire or lightning a Sorceress can produce with a snap of her fingers. Witch Doctors get dirty. They summon walls of zombies to rip apart enemies, they call forth undead demon hounds called Mongrels that they can detonate to deal heavy damage to their enemies, and they fashion the skulls of the dead into explosive grenades. The D3 team discussed the Witch Doctor's design concepts in the Denizens of Diablo panel at the WWI 2008. For the Witch Doctor, we wanted to get a rich, voodoo vibe. We wanted to avoid straight up master-caster feel. He's not just conjuring things out of thin air. WDs don't just channel magic. They take real world objects and infuse them with voodoo magic. Our spell descriptions for the WD were like, "He's going to throw a shrunken head filled with a chemical concoction." Or "He's going to create insect swarms by blowing voodoo dust from his palms." Or "He's going to sprinkle dust in the air and cause illusions and frighten monsters away." The team felt that it wouldn't be a real Witch Doctor without zombies. They go together naturally, but they didn't want normal slow wandering zombies. They mashed the idea of Zombies with the Firewall of previous games and came up with zombie wall. The Witch Doctor is angry, someone who's been broken by a life that's dealt a few too many hard knocks and not enough joy. This is someone tired of being smacked in the head, so he uses his mystical powers to get into the heads of others (and if that doesn't work, a swarm of locusts will get under their skin). The Witch Doctor skills were arranged in three skill trees, Zombie, Spirit, and Voodoo, prior to 2010. The skills and skill tree systems were entirely revised in 2010, and the active skills were arranged into one large list. At BlizzCon 2010 in October Blizzard revealed the new skill system, with all passive skills moved to traits. However, At the July 2011 Press Event, it was revealed that traits had been changed back to passive skills. The following is a very quick list. See the Witch Doctor skills page for a more thorough summary, or any of the individual skills pages for full information. Poison Dart - The WD fires a dart that deals poison damage upon impact, and more over time. Plague of Toads - Release a handful of toads that hop out across the screen in semi-random directions. Toads burst upon contact with an enemy, dealing poison damage and leaving a small puddle on the ground. Zombie Charger - Summon a zombie that charges straight forward, disintegrating into a damaging cloud of poison. Corpse Spiders - Summon spiders to attack nearby enemies. The spiders emerge from a rotting zombie corpse. Firebats - An inferno-like spray of flaming bats damages all enemies in the line of fire. Firebomb - Lob an skull that explodes on impact, dealing fire damage to all nearby enemies. Locust Swarm - Fire a plague of locusts that swarm over enemies, dealing physical damage over time. If the enemy dies the locusts will chain to other nearby targets. Acid Cloud - A DfA spell that rains acid down on a small radius, dealing poison damage to the target and leaving a DoT puddle behind. Wall of Zombies - A long row of zombies erupt from the earth and attack nearby enemies. Haunt - Launchs a ghostly creature that latches onto enemies, dealing Arcane damage over time. IF the target dies while the Haunt is active, it will chain to another nearby enemy. Horrify - A horrifying giant Witch Doctor appears overhead, frightening away any nearby enemies. Spirit Walk - An escape/movement skill that allows the Witch Doctor to leave his empty husk of a body behind and run, moving freely in the spirit realm for several seconds. Soul Harvest - A spell-casting buff. This grants increased increased spell damage for every enemy within the effective radius, for a limited time. Spirit Barrage - A powerful DfA skill, this brings down a bombardment of spirits that deal Arcane damage to anything in the radius. Mass Confusion - A curse that causes enemies in the vicinity to switch allegiances, fighting against their fellow for a short duration. Summon Zombie Dogs - The Witch Doctor summons a zombie dog to aid him. Grasp of the Dead - A debuff curse, this slows and damages enemies for a short duration. Hex - Summon a Fetish Shaman which will hex enemies into chickens. Hexed enemies are unable to perform offensive actions and take additional damage from attacks. Sacrifice - Detonate one of your Mongrels, dealing substantial damage to nearby enemies. Gargantuan - Summon a large zombie to fight for you. Big Bad Voodoo - Summon a fetish to begin a ritual dance that increases the attack, casting and movement speeds of all allies in the area. Fetish Army - Summon an army of Fetishes to fight by your side for a short duration. This is a very quick listing. See the Witch Doctor skills article for more details, or click on any of the individual passive skills for full stats and info. Mana Regeneration - Regenerates more mana per second. Mind and Body - Regenerates more health per second. Spiritual Attunement - Increases maximum mana. Care of the Master - Increases the health of pets. Quickening - Increases casting speed. Spirit Vessel - The Witch Doctor gains mana whenever he picks up a health globe. Death Pact - Reduces damage taken when the Witch Doctor is low on health. Leader of the Pack - Increases damage dealt by Zombie Dogs. Ritual of Blood - Part of mana costs for skills are taken from health. Plagued - Increases damage done by Animal skills and Plague skills. Rituals - Increases spell damage by a percentage of health. Zombie Master - Increases damage done by Zombie skills. Many traits were preserved as passive skills, but a lot them were dropped. See the Witch Doctor traits page for full info on what the traits system looked like. The facial look of the Witch Doctor, male and female, may be almost irrelevant in the game, since most characters will always have one of the masks (helms) on them. These are far more obscuring of the face than the headgear of any of the other classes. It's not yet known how exactly alike the masks are for male and female WDs. The Male Witch Doctor's face has evolved quite a bit during the game's development, at least judging from the few pieces of concept art we've been shown. The earliest version of the character was a sort of wildman of the swamp; he doesn't appear to have been brown-skinned, and the oddest part was that he carried a little shrunken monster in a backpack, somewhat like the Fetish Shaman found in Diablo II. This mini-WD was something of a sidekick, and would assist the WD in combat. One example given during a Blizzcon panel was that when the WD was stunned, the mini-WD would stand up in the backpack and beat him on the head to try and wake him up. The WD is clearly Necromancer-like, in his mixture of summonings, mind control curses, and sub-mage quality magical attacks, but the D3 team does not view the character as a replacement for the Necromancer. Q: Is the witch doctor a replacement or spiritual successor to the Necro? They seem to have rather similar skills. A: We don't view the Witch Doctor as a replacement. The Necromancer is a very cool char. We thought about him as a class and tried to see if we could improve on him, which is something we did with every class, and that led us to create the Witch Doctor. If we ever decided to make a Necromancer, the Witch Doctor wouldn't prevent us from doing so. We wanted to create a class whose pets were not his primary source of damage output. [...] Most Necromancer builds are very pet heavy. The pets do a lot of the damage, and a lot of mechanics are built around debuffing the enemy so your pets can be better against them or taking advantage of the bodies your pets create by blowing them up with corpse explosion. The Witch Doctor's pets are more of a distraction -- they're his form of crowd control. [...] We wanted to have this general notion of a character who controlled all things slimy and gross, like zombies, bats, snakes, and spiders, but he didn't rely on them -- he just throws them out there. [...] Each element is like that, where it's another distraction while the source of primary damage is the Witch Doctor himself. This makes him play very differently than the Necromancer, which was intentional. One question that arose in early conversation about the Witch Doctor, after players got to try out the class at Blizzcon 2008 and 2009, was how varied his potential builds would be. Jay Wilson addressed this issue in an October 2009 interview. Diii.net: The Witch Doctor build seems fairly narrow in concept. He’ll always have mongrels for tanking, some mini-mage support, and some minion attacks and a bit of mind control. Looking at his skill tree now, there doesn’t seem to be that many potential Witch Doctor builds, which isn’t true of the Wizard or Barbarian. Can you comment on that? Is it just that we don’t know enough about the Witch Doctor yet? Jay Wilson: The Witch Doctor is less developed than the Wizard and the Barbarian. His skills are on what we call a second round, a second revision, while the Barbarian and Wizard are firmly in their third, maybe even their fourth revision. So as every time we revisit the systems we expand the abilities. It’s based on playing them. We discover basically the same things, and we’ll say something like, “Oh, this class seems a little bit more focused than we wanted. We can’t make this kind of build the way we wanted to.” So we end up expanding them over time. In the game, every class is different. Some classes offer themselves up to a lot of variations. Some classes tend to have a lot more focus. We saw that in Diablo II, some classes had fewer variations and fewer possibilities than the others. That’s not really our goal though. Our goal is to make sure that every class is equally diverse in the types of builds they can be made for. The Witch Doctor is not going to support the "zookeeper" style of build, where a player has numerous weaker summons which can be used to swarm enemies. The class is more about precisely managing a few minions at once, rather than summoning up a horde of helpers. This point was made by Bashiok in a March 2010 forum post about the Fetish Army skill. Fetish army is really the only mass-summon spell the witch doctor has. The fetish army spell effects are coming along too, it's looking pretty amazing. But it's really more of an AoE that happens to do its damage by sending out little dudes to fight. The witch doctor is more about using a small number of summons as damage soaks, and then casting spells for the majority of his damage. Some of which are themselves larger one-off summons. He's not a mass summoner, that's just not the intended flavor of the class. Little is known about pet/minion intelligence in Diablo III. Most of the Witch Doctor's summons have yet to be shown off in a playable demo build, so it's not known how fierce they'll be, how effective, if they'll tank, if they can kill efficiently, etc. The general design of the Witch Doctor suggests that his minions will be support only; the main damage will always have to come from the WD's spell casting. I got to experiment with Mongrels a fair amount at this year’s Blizzcon, and they were definitely improved over their 2009 incarnation. Some of that was their damage, which was much higher (especially once they were runestoned), but they generally seemed more useful and where I wanted them to be. In the 2009 demo, out in the open desert around Alcarnus, the Mongrels were always running off, or ganging up on some insignificant annoyance, like a desert wasp, when I wanted them to keep up and tank the pack of Fallen with an Overseer coming straight at me. I had to recast them regularly, or run back a screen or two to try and find where they’d gotten hung up. That never happened during my PvM Witch Doctor play this year. The dogs were almost always where I wanted them to be, tanking the main threats, and doing pretty good damage. (Though they died rapidly against any boss pack, and since the mana cost to raise a Mongrel was pretty steep, I often had to stop firing my attack spells to regen enough mana to raise up a new Mongrel.) I can’t say how much of that was improved AI, and how much was this year’s demo set in a dungeon with narrow walkways and not much room for bad dogs to roam. I did note one useful thing; they never all got stuck pawing obsessively at any of the objects. That’s always so annoying in D2, when suddenly all of your minions are chewing uselessly on a Tortured Soul, or a Sarcophagus, or something you have no need or desire to stop and kill. One of the key changes to spell casters in Diablo III is the addition of +% spell damage modifiers. These sorts of modifiers were found on many skills in Diablo 2, and on a few uniques and runewords, but they were uncommon, and not necessary to kill effectively. As a result, casters in Diablo 2 were much less item-dependent than the combat classes, and found it easier to concentrate on Magic Find, resistances, hit points, and other non-damage bonuses. When viewing the listed damage on each spell, it’s important to keep in mind that those are not absolute numbers, in D3. They’re much like weapon damage; modified by your wizard’s attributes, your character level, by other skills, and also by your equipment. Lots of types of items in D3 carry modifiers that boost spell damage, usually by a percentage. I found numerous wands, staves, and even pieces of armor with values between +5-25% spell damage, and that was just in the early stages of the game. We know nothing about higher level equipment bonuses, and it’s entirely possible that the D3 team is projecting high level characters to have +100%, +200%, or who knows, +500%, spell damage. If so they’ll be adjusting the base spell damage accordingly, which might make it look very low to our untrained eyes. Here’s an example from early in the game, that was mentioned in the Witch Doctor skills report. The skill tree listed damage on my level 2 Skull of Flame spell was 6-9, yet with a level 12 Witch Doctor my Inventory screen showed 19-29 for that spell. I don’t think I had more than +50% spell damage from equipment, so assuming the display values aren’t wrong (in D2’s infamous LCS style), there are considerable bonuses added to damage from character attributes, which are then further boosted by the spell damage bonuses on your equipment. This is all part of the D3 team’s plan to make all of the attributes useful to all characters, and to make more types of modifiers useful/essential to spell casters. We don’t know enough yet to judge how well it’s working, but it should be a substantial change from how spell damage was calculated and scaled up (or not) in D2. The Witch Doctor is the only class in Diablo 3 who uses mana as a character resource. In this the WD is very conventional and familiar to people who played Diablo and Diablo 2. The character casts spells that cost X amount of mana, which regenerates over time, at a rate determined by various factors including total mana pool, item modifiers, and relevant skills. Mana regenerates slowly compared to a resource like Arcane Power, but the amount of mana available to the Witch Doctor increases (and scales) with level. Diii.net: Do you envision the health globes will boost [non-mana resources] in the way that the Wizard and Witch Doctor gained mana from them at Blizzcon? Jay Wilson: Um, maybe? *sounding intrigued* Usually in the third or fourth skill revision on classes we look at that kind of thing. For the Witch Doctor we figured that a lot of the mana things we had on the Wizard would work better on the Witch Doctor. We were having trouble maintaining enough mana while play testing the Witch Doctor. Especially if players didn’t take a specific mana recovery skill. So we focused on spreading that out across a lot more of the class so he can pull mana back more easily. When we get to other classes I’m sure we’ll look for more of that. But the key is that we don’t necessarily want to... we don’t want to cannibalize an existing gameplay mechanic. So when you take health globes that are already important, and you make them even more important, then that doesn’t really create gameplay. For the WD, the health globes weren’t that important a lot of times, since he very rarely took damage with his pets, so for him by enhancing his desire for health globes, we’re really putting gameplay where it wasn’t. So whatever we’re designing a class that’s what we look at. Witch Doctor with a Mask, Mojo, and Ceremonial Knives. The Witch Doctor has three item types that are specific to the class: Mojos, which are held in the off-hand, Ceremonial Knives, and Voodoo Masks. Class-specific items not only add visual flavor to a class, but they also allow the developers to add in specific item modifiers and affixes that are appropriate only to that certain class, to avoid having an inordinate amount of "junk" items spawned for the other classes. As previously noted in this entry, the similarities between the Necromancer and the Witch Doctor, while not legion, are certainly not few. 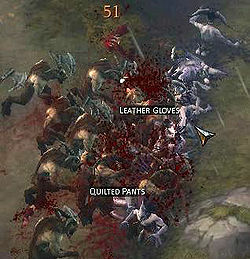 The off-hand Mojos certainly add a necromantic flavor to the class, high reminiscent of the Shrunken Heads that the Necromancer had available in Diablo II: Lord of Destruction. In addition, the Witch Doctor will carry his Ceremonial Knives (and also daggers) in the same highly-stylised, distinct manner that the Necromancer did in Diablo II, which should be welcome to most fans. Especially those with a Poison Dagger build in D2. The masks are not part of any specific tier of item sets, but are their own models/textures and are individual like the mojos and daggers. There are only a few masks at present but they are very distinctive in appearance. The Witch Doctor comes from the an area of the Torajan jungles called Teganze on the southern tip of the great eastern continent, just southwest of Kurast (where Act Three took place in Diablo II). You can see it located on the World map close to Kurast. The fearsome Witch Doctor of the umbaru is believed to be a legend by many, but Abd al-Hazir has seen them with his own eyes, documented in the thirteenth entry of his writings. The Witch Doctor uses terrifying precision to assault his foe's mind and body with elixirs and powders evoking fires, explosions, and poisonous spirits. He can also summon and control undead creatures from the netherworld to combat his enemies. Witch Doctors come from the Tribe of the Five Hills, who frequently engages in tribal warfare with both the Clan of the Seven Stones and the Tribe of the Clouded Valley as a ritual rather than conquest. The tribes use these wars to replenish their supply of human sacrifices their civilization revolves around. Only those taken in battle are considered worthy of the ritual sacrifice according to the code of heroism and honour of the tribes. The tribes define themselves by their belief in the Mbwiru Eikura, which roughly translates to "The Unformed Land". Their belief holds that the true, sacred reality is veiled behind the physical one we normally experience. Their vitally important public ceremonies are centered upon sacrifices to the life force that flows from their gods, who inhabit the Unformed Land, into this lesser physical realm. Witch Doctors are finely attuned to this Unformed Land and are able to train their minds to perceive it through a combination of rituals and the use of selected roots and herbs found in the jungles. They call the state in which they interact with this other world the Ghost Trance. The second most sacred belief of the tribes is their philosophy of self-sacrifice and non-individuality, of suppressing one's self-interest for the good of the tribe. Their most current war created an intense social upheaval among the tribes due to an incident, of which details are lacking, but might be the reason the Witch Doctor has traveled west to Tristram. The Witch Doctors are seen as alien, strange, and untrustworthy by the NPCs in the game. This isn't surprising, as the Witch Doctors look very odd in their gear, and are far from traditionally-armored warriors. Captain Rumford's greeting to the Witch Doctor, newly arrived in Tristram in Act One at the very start of the game, illustrates this clearly. Captain Rumford - I almost killed you walking round here looking like that. I don't have time for this insanity. Were you expecting me to beg for your help? I can tell you think you're some sort of adventurer even without proper clothing. Witch Doctor - It is a small being that dismisses things simply because they are different. No matter. I am here to storm the dark scourge brought by the fire from the sky. Captain Rumford - Well it landed in the old Tristram cathedral up the road so don't let me keep you. The only thing you'll be finding there is your death. Have fun. As related in the 13th entry in the writings of Abd al-Hazir. Skull of Flame animation shots. Diablo III Media Coverage Archive for all interviews, previews, pictures and more. This page was last edited on 6 December 2017, at 02:43.